The Towpath Volunteers have been bringing Our American Heritage to Life for over 30 years. While the "Senior Corps" has continued to grow in size, difficulty in music and in "Fifing and Drumming Excellence" it makes it difficult for new members to easily jump in and feel comfortable marching and performing. Not being able to participate in parades, which is an awesome feeling to perform for people, can lead to boredom and displeasure. 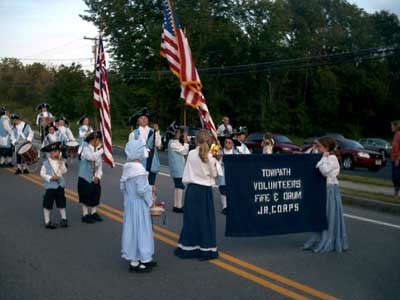 To help get people onto the streets as quickly as possible, we formed the Towpath Volunteers Junior Fife and Drum Corps. The idea behind the "Juniors" is to provide a unit that plays fewer and less difficult songs to make it easier for members to get started. With a limited marching schedule, it gives the younger as well as the young at heart, a chance to test the waters. 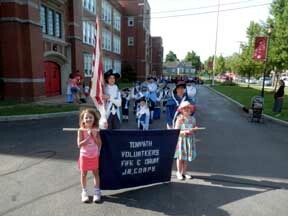 The Towpath Volunteers Junior Fife and Drum Corps marched in two Memorial Day Parades on Monday, May 26th, 2014. The first parade was in Palmyra and the second parade in Macedon Center. The Palmyra parade had great weather, sunny and not too hot. A great turn out for the group as 22 marchers participated with 15 of them first time performing with a fife or a drum. 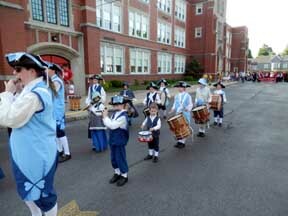 The line up for the parade was at the Palmyra – Macedon Primary School on Canandaigua Street. The parade route took the group down Main Street in front of a very enthusiastic crowd. The slightly over one mile parade route concluded at the Military Monument in the Palmyra Cemetery. The Memorial Day Parade in Macedon Center was even better! With the experience of having already marched and the jitters now gone, the juniors’ conquered the less than a mile route flawlessly. After a few short speeches at the Historical Society Building, the corps marched to the cemetery in front of a crowd that clapped with approval, at least the ones that weren’t taking pictures or videos. 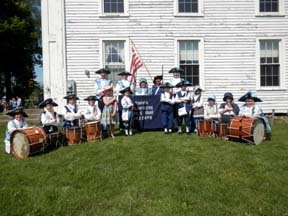 Junior Fife and Drum Camp open to Public! 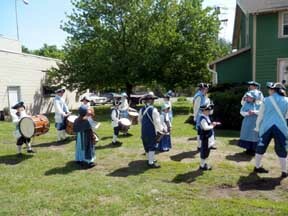 The plans are under way to hold the Junior Fife and Drum camp in August of this year. The camp was not held last year due to scheduling of instructors so planning has started early this year. Current plans are to have camp from 9:00 am - 12:00 noon, Monday - Thursday. Several locations have been suggested and are under consideration. The program was so successful in previous years that the group feels it could be expanded to include non Towpath members attending to allow them the opportunity to have lessons on a drum or a fife and see if they would be interested in becoming a member. The Towpath Volunteers will supply the fifes or drum sticks, music and the teachers for the event. The campers will have individual and group lessons on the instrument they choose and then all campers come together to play together. 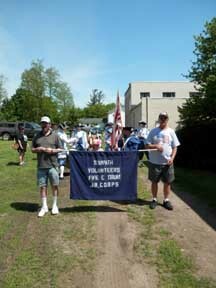 By adding some time for marching, it will give the campers a taste of what the Towpath Volunteers do. Camp spaces are limited and Towpath members will have first option before spaces are advertised. Additional details, schedules and how to enroll will be announced soon! The Towpath Volunteers Junior Corps has seen many great years and many years not so great. In reality, the Junior Corps place is to prepare members for the transition to the Senior Corps as quickly as possible. In such, a large group at the beginning of any marching season should become smaller as the year progresses. In turn, this gives the leadership roles in the group to the weaker members and thus gives these members the opportunity to build confidence as leaders. As sad as it is not to have a Junior Group at times, the lack of one shows us that the idea behind this group is working. This is not to say we haven't had members in the group for multiple years, especially the youngest members who would have trouble marching with the seniors. Other reasons include, members learning a second (or third) instrument, additional parades used to perform and gain confidence in playing, or members that prefer to perform with the Juniors as it is low key and no pressure. The other notion that needs to be addressed is the age perception of each group. While the Senior Corps is comprised mostly from adults, we have many talented youngster marching and performing with them. This is true for the juniors as well. The membership is not determined by age, but by ability and confidence. The junior corps has, at times, had as many adults as youngsters. 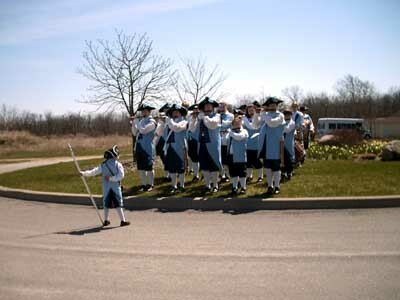 Towpath Volunteers Fife and Drum Corps Inc.